Tumblr just keeps growing and growing. It is a micro-blogging platform of choice for millions of active internet users who find that tweeting and updating on facebook aren’t quite enough. With Tumblr, recently purchased by Yahoo for $1.1bn, you create a Tumblelog for yourself. Navigating the user-friendly dashboard is easy with a number of big, graphical icons to choose from. From there you can create new posts which may include text, photos, links, famous quotes, chat transcripts, audio or video. Tagging is widely used, much like with Twitter, to categorize individual posts. No HTML or other sort of coding knowledge is required, as the page will adjust automatically depending on what type of content has been added. This ease of use has helped to make Tumblr one of the most successful blogging sites. 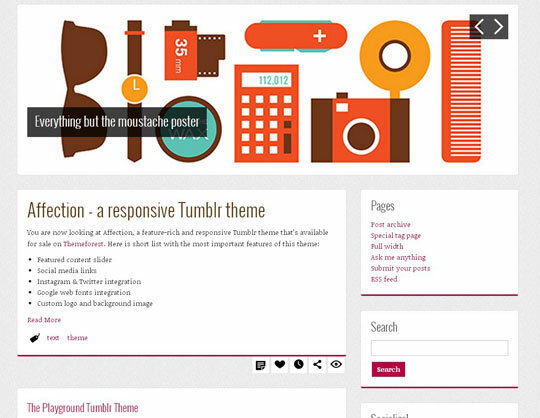 There are a whole host of excellent Tumblr themes to choose from on the site or you can locate a free or premium theme from elsewhere. Then you just need to add it to your Tumblelog to give it a unique look and feel. Many of the members of the Tumblr community have been busy making their own themes for other members to enjoy, so it is a good idea to search around. You can add a bookmarklet for your web browser too. 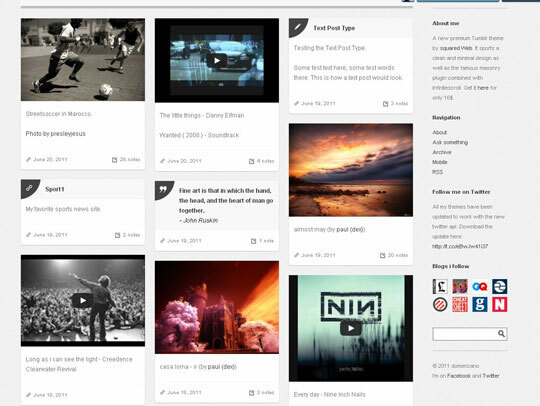 This will allow you to easily add new content to your Tumblelog without needing to be on the site at the time. There are also mobile apps for several platforms including iOS to enable fast additions while on the move. In today’s post we have gathered premium Tumblr themes.The below themes are all handpicked and i’m sure you will find one for your needs. 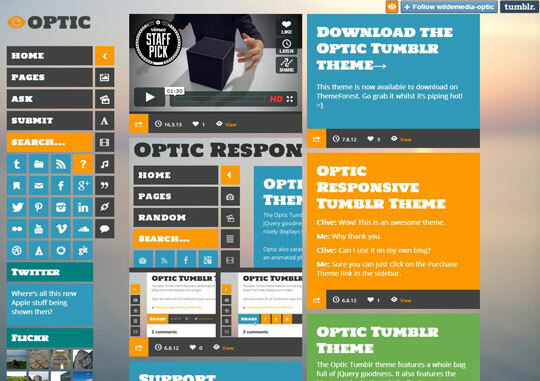 Optic is a responsive Tumblr theme perfect for any blog type featuring the Masonry jQuery plugin. Showcase your artwork with complete focus on the post.Optic comes packed full of jQuery awesomeness and shows your posts in all their glory. Pick colours for any part of the theme so you can fully customise it the way you want. Also pick your favourite font from the Google fonts library and add it in using the themes options panel. The themes only image is the logo and the images you post it’s completely CSS. 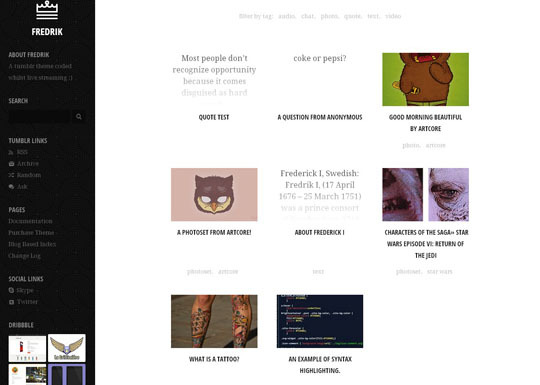 Fredrik is an adaptive Tumblr theme which includes a Grid based Index Page which is great to use as a portfolio for a Illustrator. Also includes the traditional Blog based Index Page, as well as other features.Super easy to customise with support for Disqus, Flickr, Twitter, Dribbble, Instagram and Google Analytics. Also includes new features unique to this theme. 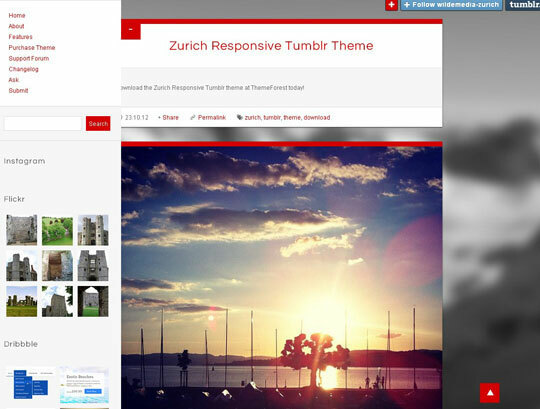 The Zurich Tumblr theme is perfect for any type of blog. It makes your content center stage, giving it the exposure it needs. Zurich comes packed full of features and widgets.Zurich uses some subtle yet effective jQuery effects making your viewing experience a dream. The theme resizes when the browser window is resized making the Zurich theme look great on any device or computer screen. Zurich combines modern web standards, retina images and a responsive layout to bring you the best in viewing pleasure. 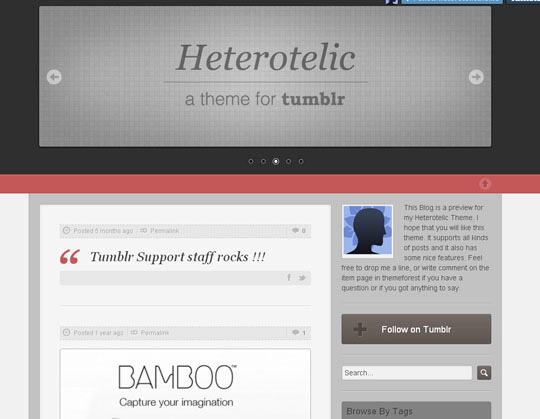 Heterotelic is a two column tumblr theme.Setting up this theme and changing the options are very simple, achievable through the customize options at Tumblr. 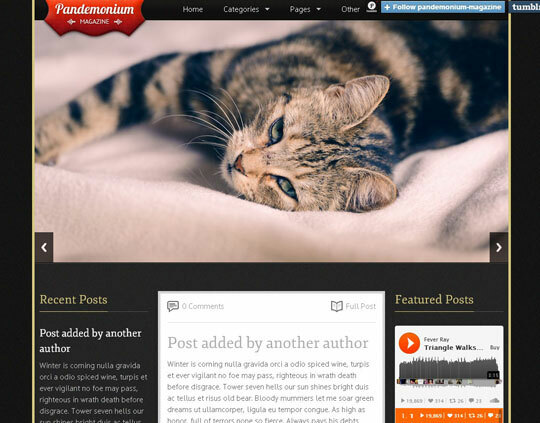 Pandemonium Magazine is a simple and aesthetic magazine style template for Tumblr. It’s dead easy to use and transform with almost 100 options of customization.The whole code was written again from the beginning and it was converted to HTML5. The template is now responsive and gives you a choice between 1, 2 or 3 columns layout. Domericano is a clean, minimal and beautiful Tumblr Theme using the Masonry effect as well as optional Endless scrolling. 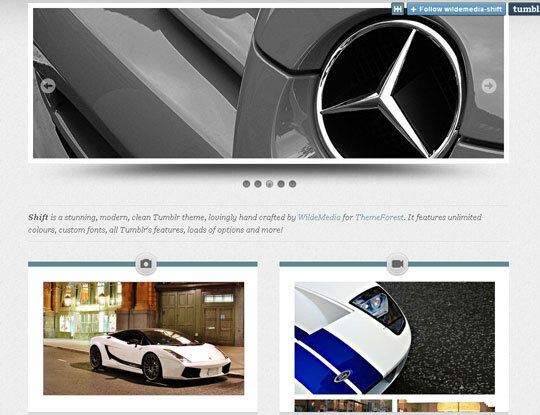 It is suited for all kinds of blogs and portfolios, easy to install, has a ton of options and is heavily jquery enhanced. 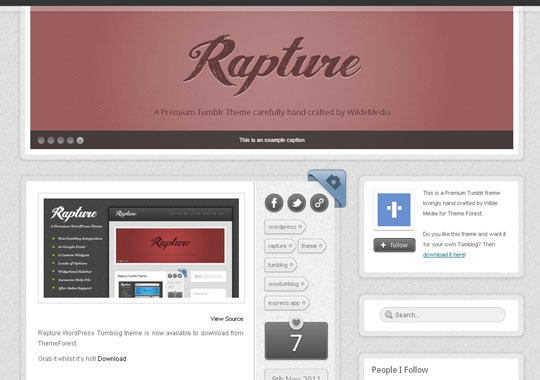 Rapture Tumblr theme is perfect for anything from a portfolio, personal blog, group blog or business blog. It features an image slider to showcase your best work, which can optionally be switched off if you would prefer not to have one.The Rapture Tumblr theme comes with an extensive amount of options allowing you the freedom to customise your blog with little code exposure. All the widgets in the sidebar can be turned off or on through the Appearance menu when customising your Tumblog. 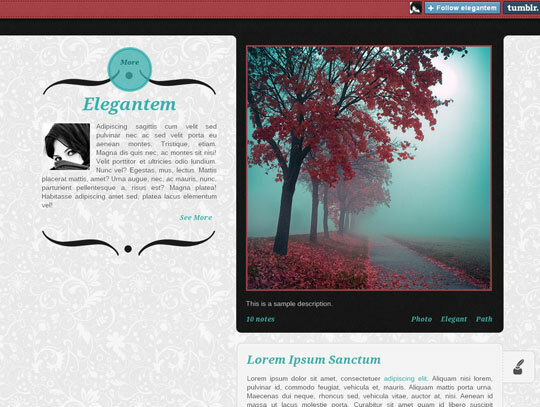 Elegantem is a Tumblr theme that beautifully merges design and function. Emphasizing your latest entry, this theme has a customisable layout and even supports popular social media services.Packaged with this theme is a detailed instructions manual, an extra sliced Photoshop file that didn’t make the final cut (it’s a freebie) and also some free icons you can play around with. 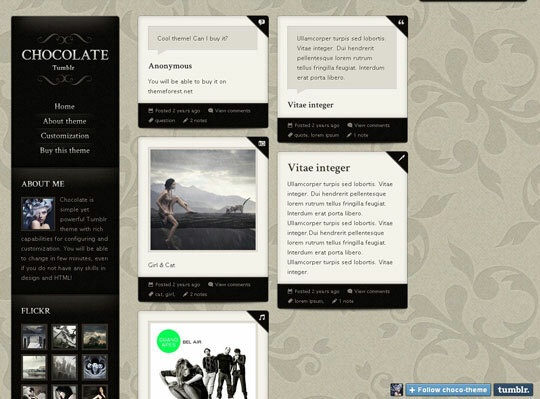 If you need clean, light and simple Tumblr Theme, Chocolate T is for you. It is refined and elegant template with complex and precise combination of light gradients and shadows. 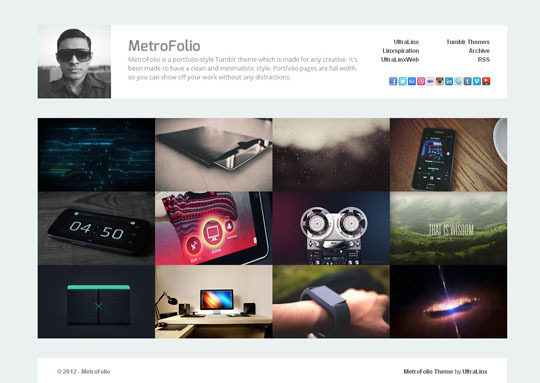 MetroFolio is a clean portfolio style Tumblr theme made for creatives out there, whether you be a graphic designer or product designer. It’s been made to have a portfolio look for a professional presentation of your work. 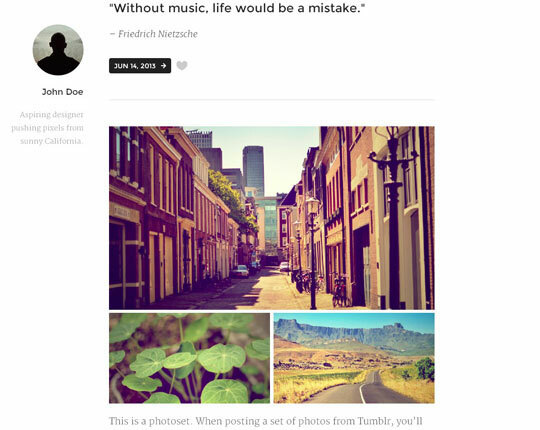 The Shift Tumblr theme is ideal for any blog, from a personal blog to portfolios! 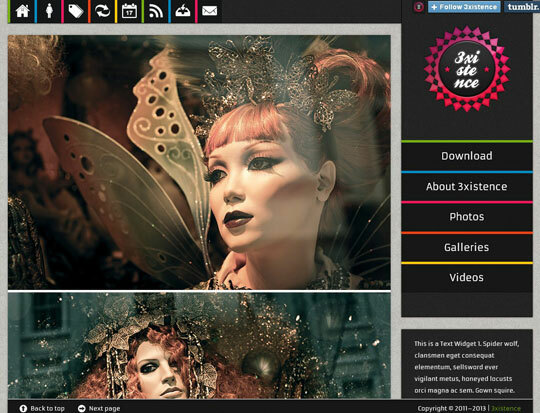 The image slider allows you to showcase your favourite images or best portfolio work. Shift supports all of the Tumblr post types and also features a custom post page with a sidebar to add affiliate links or a Flickr photo feed.You can set ANY colour you like for the theme by simply clicking on the Appearance tab and selecting a colour!The footer on the Shift Tumblr theme allows you to show off your latest Tweets, latest liked post and the people who you follow. Luomo v1.3 let’s you choose between a photo grid and a slider when displaying your photo sets. 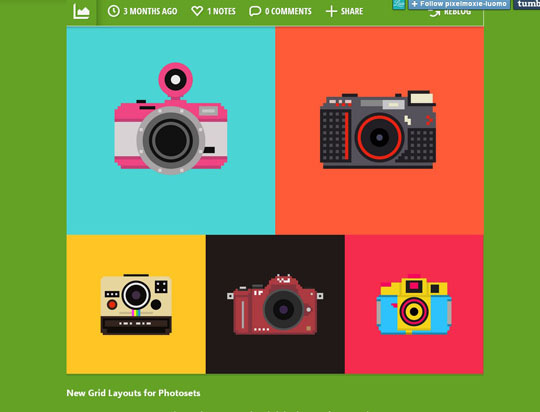 You can enable the grid layout site-wide or in a per-post basis. 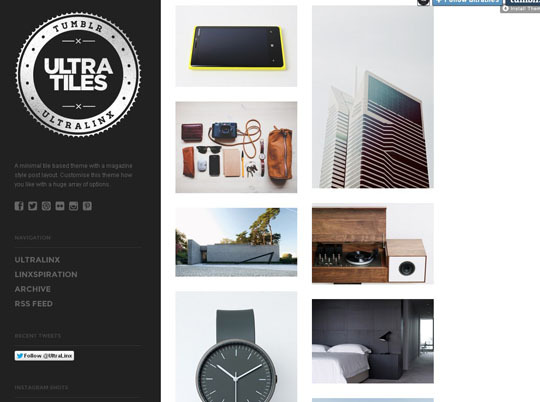 UltraTiles is a minimal tile based theme with a magazine style post layout. It has a huge array of features so you can customize the theme how you like. 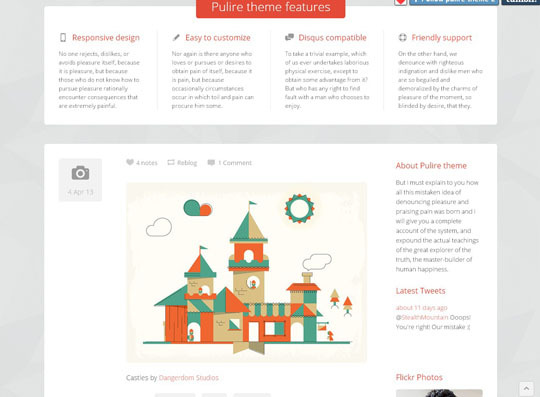 Nearly everything about the theme can be changed so you can make it look how you like. 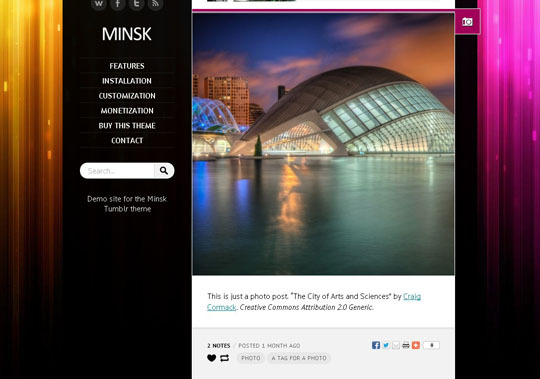 FeelinDreams is bring new theme with clean minimalist look for great reading experience. 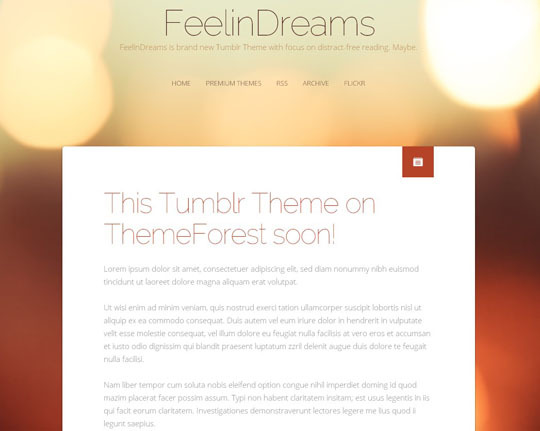 FeelinDreams is responsive, fresh and simple with . Check the features!One minute install! Just download the code and paste it as HTML into your Customize section of your Tumblr blog. Today it is most important to have responsive web design. 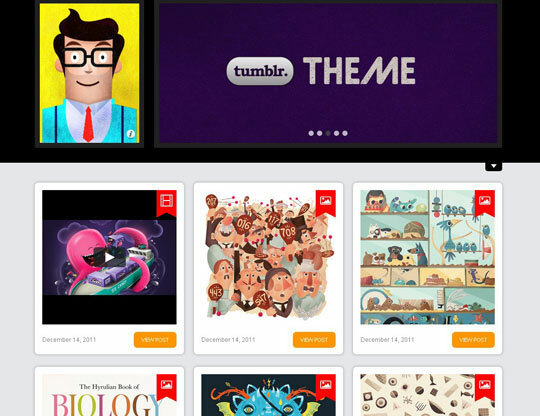 You have shared awesome collection of Tumblr themes.